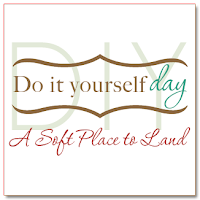 Today is DIY Day on A Soft Place to Land, brought to my attention by Lauren (who submitted her fantastically redone chairs). I submitted the painted dresser (terrible photos and all), #174 on Soft Place to Land's list of submissions. Here's where the BONUS comes in. This submission prompted a comment on my blog by another Soft Place to Land reader, Katherine at Grass Stains. I was looking on her blog, and stumbled across a delightful post titled "Things People Say That Make Me Want to Hurt Them." Please find it here. 1. "all intensive purposes" instead of "all intents and purposes"
2. "Let's take Jerry and I's car." GRODY! any of these just kill you too? i lose sleep over those things! It's funny you brought up "all intents and purposes" this was mentioned on an episode of King of Queens that I caught while getting a pedicure. I can't stand when people pronounce the "t" in often and when people say suposebly. Ugh! that's the sms coming out in you!